Fashion With A Conscience has moved. Visit www.fashionwithaconscience.org: Just because we love it...and own it! Boot edition. Just because we love it...and own it! Boot edition. 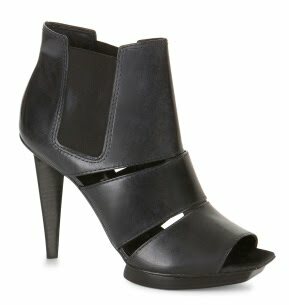 Ebbe cutout booties by BCBGMAXAZRIA, $275. Purchase here. Ok, let me explain. Yes, you read properly. I simply could not help myself. I went on a little shopping spree last weekend and bought these sky high BCBGMAXAZRIA booties! I know the economy is at a low but how will it ever recover if we don't give it a little push? Somehow this last statement helps dissipate all of my guilt. :) My wish list was long: chain purse, satchel, red wool coat, black skinny jeans, blue skinny jeans (the skinnier the better), boyfriend distressed jeans, button-down shirts, pearls, aviator shades, and on the very top of that list, boots - all kinds of boots: flat knee-high boots, rain boots, high heel boots, over-the-knee boots and of course booties. My spirits were high and so was the tab. But who cares? My Ebbe cutout booties were totally worth it! I did my part for the economy, will you do yours? P.S. : I might let you in on some other great buys! Who knows? This might inspire you to give the economy a boost with a shopping spree of your own!